With Red Dead Redemption 2 swiftly galloping towards an October release date, now’s the perfect time to jump back into the saddle with John Marston’s emotive open-world epic. Cowboys are awesome and if anyone tells you otherwise, hock a dirty wad of chewin’ tobacco in their face. All right, you probably shouldn’t spit at anyone, but you most definitely should revisit Rockstar’s iconic Western. Thanks to Xbox One’s exhaustive list of backwards-compatible titles, I’ve recently gotten reacquainted with Red Dead Redemption. Even though this wondrous Wild West smash hit is almost seven years old, it remains one of the best sandbox games ever made. Don’t believe me? Just wait until you get to that magic musical moment in Mexico. Marston’s sweeping frontier adventure is so much more than its expertly chosen soundtrack, of course. José González’s haunting “Far Away” may woo your ears, but its Red Dead’s mesmerising Wild West world that’ll forever capture your heart. Rockstar has since taken sandbox scale to new heights with Grand Theft Auto 5’s masterfully varied Blaine County, yet no game before or since has ever captured the same captivating sense of time and place quite like Red Dead Redemption. Made up of two fictional American states, and a generously sized approximation of Mexico, Redemption’s map pens a mournful, longing love letter to classic Western iconography. Even after all these years, the Old West playground Rockstar San Diego built has the power to elicit stunned silence. This is the same majestic, unshakeably lonely landscape master moviemakers John Ford and Sergio Leone so expressively brought to life in The Searchers, or Once Upon A Time In The West. Solemn, sweeping and ever so slightly sad, Red Dead’s yawning deserts, claustrophobic canyons and jagged mountain ranges offer the perfect, disquieting antidote to the obnoxiously noisy cities so many lesser sandbox games churn out. You can ride along with the last of the buffalo as you drink in the sprawling greenery of the Great Plains. Crank your cowboy’s virtual neck skywards admiring the jutting sandstone buttes dotted around Alta Cabeza – a faithful facsimile of Utah’s iconic Monument Valley. Feel a pang of sympathy for Marston, as the out-of-his-element outlaw suspiciously eyes early 20th-century automobiles sputtering around the cobbled streets of Blackwater. Red Dead Redemption is a poignant tribute to the dying days of the Old West; one that makes you cherish every moment exploring its lonesome landscape. Few characters come more compelling than John Marston. Unlike the conveyor belt of criminal jerks GTA rolled out, Redemption’s charismatic cowboy is a fundamentally decent man. Few leading characters come more compelling than John Marston. Unlike the constant conveyor belt of criminal jerks GTA has rolled out since 2001, Redemption’s charismatic cowboy is a fundamentally decent man. Is he capable of cold-blooded acts? No question. Yet even as he hunts his former gang while acting as a government patsy, the steadfast devotion he shows for his family is always there. Wonderfully brought to grizzled, compassionate life by Rob Wiethoff, Marston is a conflicted, complicated killer, yet ultimately, someone you pull for. The ravages of time can often erode older games’ appeal. That’s just not the case with Red Dead. Its crunching, somewhat stiff gun battles may have been topped by modern sandbox fare, but few titles can match Redemption’s rapier-sharp script, fascinating lead, or that magnificent Western world. 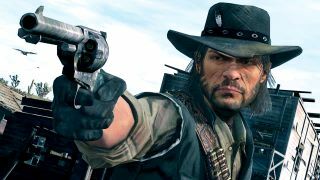 As Arthur Morgan rides into view with Rockstar’s follow-up, it’s hard not to daydream about pristine 4K prairies on Xbox One X. In the here and now though, few lily-livered open-world pretenders have ever matched this Xbox 360 masterpiece. This article originally appeared in Xbox: The Official Magazine. For more great Xbox coverage, you can subscribe to OXM here.